Education, Preschool - Curricula - Handbooks, manuals, etc., Education, Preschool - Activity programs - Handbooks, manuals, etc., Classroom learning centers - Handbooks, manuals, etc. 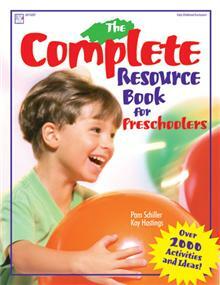 Pam Schiller, Ph.D., is an early childhood author, consultant, and highly sought after speaker. She has written numerous articles for early childhood journals, including Child Care Information Exchange and Texas Child Care Quarterly. Pam is the author of five early childhood curriculums, eleven children's books and more than 30 teacher and parent resource books. Kay Hastings, Ph.D. has over 22 years of teaching experience in the field of early childhood education. She co-authored The Complete Resource Book with Pam Schiller. The Complete Resource Book is like having a master teacher working at your side, offering you guidance and inspiration all year long.